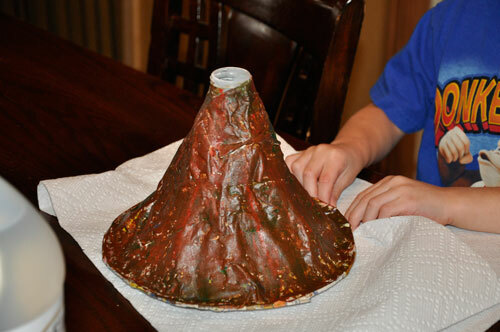 My sister bought my kids a volcano kit for Christmas. They made the volcano, and had a blast pouring the vinegar into the center and watching the bubbles ooze out the top. Unfortunately, the volcano didn’t last long. The kids were begging to each make their own volcanoes. Buying three new kits was out of the question. I knew there had to be an inexpensive alternative. 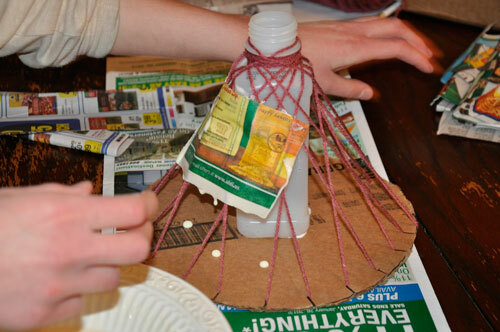 Using mostly recyclable items, we were able to build a volcano model at a fraction of the cost. 1. 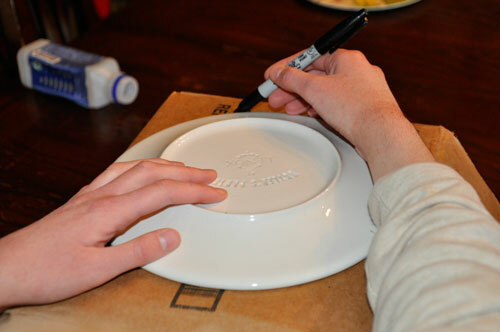 Using a medium to large plate as a template, trace around the plate onto the cardboard. 2. 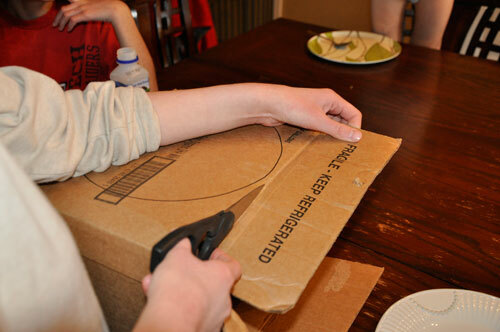 Cut out the cardboard circle. 3. Mark around the edge of the circle in approximately 1 inch increments. 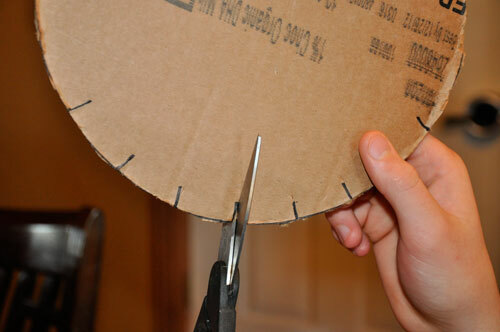 Cut the marks 1/2 inch deep using scissors. 4. 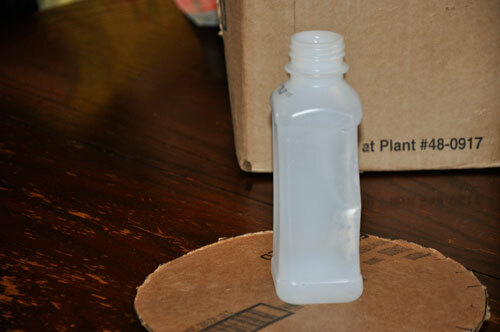 Glue the plastic bottle to the center of the cardboard. 5. Tie the yarn around the top of the bottle. Pull the string down through one of the notches in the cardboard. Bring the yarn up through the next notch and wind around the neck of the bottle. Continue winding the yarn down through a notch, up through the next notch and then around the bottle neck. 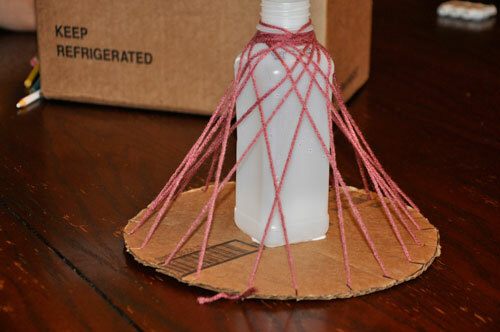 Once you have gone all the way around the cardboard, cut the yarn and tie it around the bottle neck. 6. 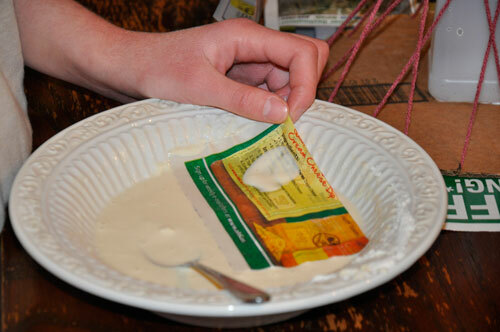 In a bowl, mix equal parts of flour and water to form a paper maché paste. We used a little more than 1/2 cup each for our volcano. 7. Cut newspaper into small strips. Dip the strips into the paste and lay across the strings. 8. Continue covering the strings with the paste covered newspaper strips. Cover the entirety of the yarn strings. Make sure you don’t cover the opening of the bottle. 9. Let the newspaper strips dry overnight. Paint the volcano as desired. 10. 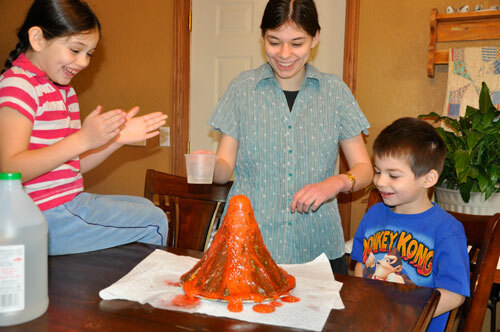 To erupt the volcano, place some baking soda and a packet of Kool-aid (or a few drops of food dye) into the bottle. Slowly pour white vinegar into the opening of the bottle. You may need to experiment with the amount of baking soda and vinegar to use, based on the size of your bottle. We used 1/4 cup of baking soda and almost 1/2 cup of vinegar. 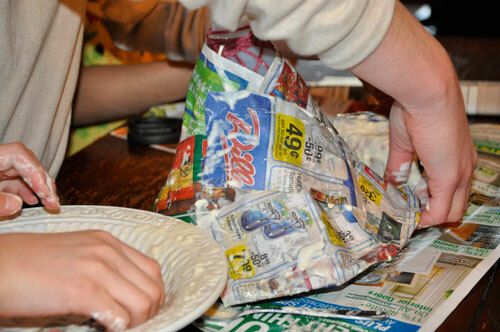 You could create your own volcano kit to give as a gift by precutting the cardboard and newspaper, including all the supplies, and printing out instructions. Package it in a box, and maybe even include a picture of a volcano your kids made. My son made his own “volcano” yesterday – by putting baking soda in a cup and pouring in vinegar. Then I remembered seeing this post and we have done it finished through the newspaper and paste. Can’t wait to finish it up tomorrow! 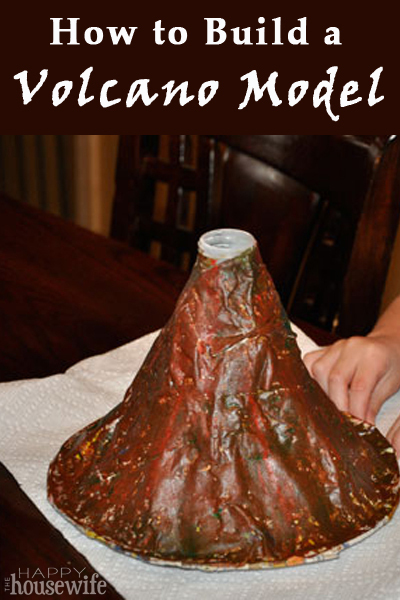 Just curious as to how your volcano turned out…hoping it was as fun as ours! It turned out great! My son and his siblings all loved it. We “erupted” it many times, over many days. Thanks for the directions.